Does Pipedrive automatically de-duplicate contact records created by Zapier? Nope. Need to search your HubSpot CRM notes by keyword? Sorry, no can do. How about exporting your CRM data, including data relationships, sales rep tasks and customer interaction history? Uh-oh, your CRM’s native export tool may not allow that. Fear not - Use the API, Luke. 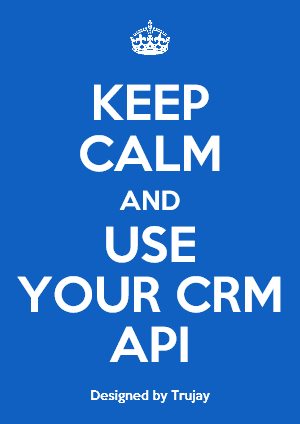 Many awesome, CRM API-powered, point and click applications are out there. One of them may just make you a Data Hero. Most CRMs have native export capabilities. Native exports often lack details such as associations between deals and contacts. Some exclude contact interaction data like notes, emails or tasks. Certain export formats are difficult for humans to work with (I’m looking at you, JSON). On the native CRM data import side you may find surprising limitations. Some records may not support importing, linking/associating records during import may not be allowed. Interestingly, many CRM API’s have advanced capabilities allowing these limitations to be side-stepped. Requests for assistance with CRM migrations were so common that we built Migrate My CRM, using APIs, to help people migrate onto HubSpot CRM. For migrating onto other CRMs we sometimes recommend Import2’s utility. Not everyone in your company requires (or desires) access to your CRM. Still, it can be useful for others in your org to know when certain CRM events happen. At Trujay we choose Slack as our team communication tool. If a tree falls in a forest and no one is around … YES, we will know about it because there will be a Slack message. To share CRM related notifications (like “New Deal”) we use Zapier to send events to a shared Slack channel. This gives our Professional Services team visibility into upcoming project work and helps keep us all focused on deal flow. We’ve also helped customers apply Zapier to their CRM workflow challenges. It is not uncommon to use one system for marketing / campaign management and a different system for managing contacts and deals. We recently had such a customer, using Pipedrive for sales deal and contact management and HubSpot for website forms and marketing campaigns. The split data made it difficult for the marketing team to measure campaign effectiveness. In their case they needed the Pipedrive sales data pushed into HubSpot for a few months while their sale team transitioned onto HubSpot. Guess what? We used the Pipedrive and HubSpot APIs to hook things up. There are many ways to monitor, analyze and report upon sales activity. Most CRM systems include basic native reporting. It’s good to know that other API powered reporting options are out there if you outgrow your CRM's native reports. Databox is one that we sometimes recommend to customers. We have also tried and like Grow. Attentive is another one (we’ve not yet tried it) offering some nice capabilities, including Sales Velocity reporting. Duplicate records happen. That's life. Most modern CRMs support some kind of manual "record merge" feature to consolidate records you come across. This works great, but it can be time consuming if you have a large backlog of dirty data to work through. That's where a utility like Dedupely may come to the rescue. Certain integration requirements are just plain special. To deliver custom data integration projects we regularly use Dell Boomi and Workato. Other Cool CRM API Use Cases? Do you have a favorite API-driven, CRM-extending, utility? We would love to hear about it. Oh, what about that HubSpot note search thingy? There is a rumor here that HubSpot have this in beta ... so you may not need to reach for that API just yet. Trujay just passed a key milestone of 50 customers. Trujay Group started operations in Q2 of 2016, and we have now signed up an impressive list of partners and customers that were in search of quality integration and migration solutions.